FUTURES is the most comprehensive futures studies encyclopedic dictionary that exists to date. 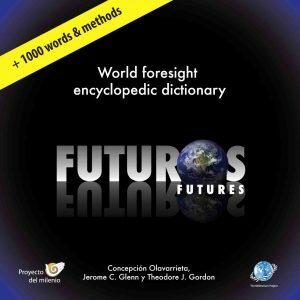 It comprises over 1,000 terms and methods used in futures studies. 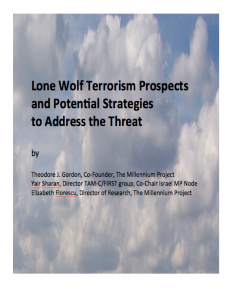 The work was initiated and coordinated by Concepción Olavarrieta, with review and edits of terms done by Theodore Gordon and Jerome Glenn, and with the contribution of more than 500 futurists from The Millennium Project network. It is avalable in English and Spanish. It can be downloaded as pdf file, or purchased as a CD. by José Luis Cordeiro et al. 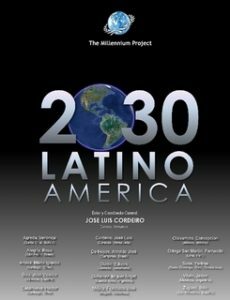 Scenarios de Latinoamérica 2030 El Millennium Project inició un estudio de dos años sobre el futuro de Latinoamérica en 2009. La primera fase de este estudio consistió en la realización de una encuesta con la metodología Real-Time Delphi (RTD) durante los ejercicios 2009 – 2010, y un segundo estudio RTD que ha sido diseñado para integrar los resultados del primero en forma de escenarios de Latinoamérica 2030. Más de 550 personas de alrededor de 60 países participaron en el estudio durante un período de siete semanas. El Real-Time Delphi ayudó a identificar algunos desarrollos con alta probabilidad y gran relevancia (denominados “buena apuesta”) y otros con relativamente baja probabilidad pero gran relevancia (denominados “sorpresas”). Adicionalmente, los expertos corroboraron el “ascenso” de China y el posicionamiento de Brasil como el país más influyente de Latinoamérica. Never before have technological advances had so great an impact on security—not only increasing the nature and level of threats, but also for the possibility of providing the means to address the threats. Technologies that could increase security include ubiquitous and omnipresent surveillance systems, the use of new algorithms for big data, improving bio- and psycho-metrics, and artificial intelligence and robotics. Yet trustworthy and reliable partners and an active and alert society remain sine qua non to reduce terrorism. We believe that a new kind of arms race is developing. 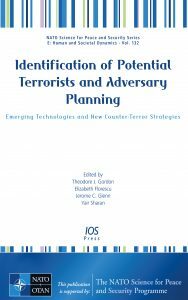 On one hand, is the possibility of increasingly destructive weapons falling into the wrong hands, and on the other, the development of new methods of surveillance and pinpointing individuals with malintent. Will the methods of detection be adequate and timely enough to avoid catastrophe? It is often said that one of the major purposes of futures research is to provide lead-time to decision makers and the decision process; we have lead-time. We hope it will be used to reduce the threat we see in front of us. Albert Einstein is supposed to have said, “The world will not be destroyed by those who do evil, but by those who watch and do nothing.” We hope we have done something with this book. *Nearly all The Millennium Project Publications and Special Studies are available on GFIS for subscribers.